The Southwest Through Wide Brown Eyes: Arches National Park - The La Sal Viewpoint and the Beginning of Grand Vistas. 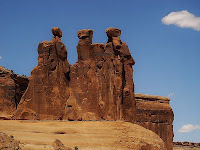 Arches National Park - The La Sal Viewpoint and the Beginning of Grand Vistas. Now while you can walk the Park Avenue Trail, see the backside of Courthouse Towers and come out in the general area of the Towers, I prefer getting back in the car and doing the drive to the La Sal Mountains Viewpoint. Walking out onto the slickrock to the informational display, be careful of not tripping over your own feet; you'll be so busy looking at the view to care about footing. As you slowly begin to turn to see towards the direction of the Courthouse Towers, you'll notice a small formation in the desert. It is not named on the display, but this sandstone covered in red mud resembles a castle; well that is what my imagination pictures it as. Now for those of you who love Harrison Ford and the "Indiana Jones" movies, you should recognize this grand vista of the Courthouse Towers area; how it leads the eye down into a valley of giants. In the opening of the third movie, "Indiana Jones and the Last Crusade", a young Indy is attempting to elude the bad guys through a valley of reddish sandstone towers. That's correct, it was filmed in Arches National Park in the Courthouse Towers area. How about I introduce you to some of these silent and stoic stars of Arches? To the left is Courthouse Towers and standing nearby are The Three Gossips; you know there always has to be someone whispering about the trials going on at the courthouse. Downwind from the Gossips is Sheep Rock. Looking to the right side of the valley view, The Tower of Babel stands next to The Organ. There is a parking area nearby; get out and walk around and you'll come to the realization that next to these ancient sandstone giants, you are a puny nothing. They have existed for centuries, and will continue to exist for centuries more after you become as simple dust. Now that you have been humbled, or maybe not; anyway, time to do a little traveling along the paved roadway. You'll be passing by the Petrified Dunes and in the distance will see Balanced Rock and the rock lineage of The Garden of Eden and the Windows. After visiting Balanced Rock, take the roadway around it and this will lead to the Garden, Windows and the Cove of Caves. If you continue straight on the road though, you'll find another secondary road leading to Delicate Arch. Choices, choices, and what you see and do all depends on how much time you want to devote to discovery.